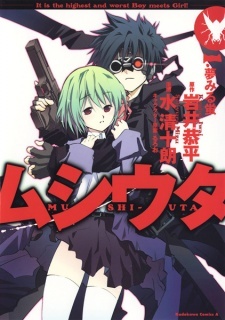 Mushi-uta's story takes place in the near future. Ten years before the story's opening, strange insect-like creatures known as "Mushi" began appearing. The Mushi are able to consume peoples' dreams and thoughts in return for supernatural powers. Protagonist Daisuke "Kakkou" Kusuriya encounters a young girl named Shiika Anmoto. The two, in time, become quite close. However, unbeknownst to Kakkou, Shiika is an escapee from a secret prison known as GARDEN where those possessed by the Mushi, known as the Mushitsuki are held. GARDEN's military force, the Special Environmental Conservation Executive Office, dispatches its finest killer to track down Shiika. However, they are faced with resistance from the Mushibane resistance organization, led by the secretive "Ladybird".